SPOKANE, Wash. - Toxic discharge from a British Columbian smelter becomes trapped in the Columbia River Valley, creating a "public nuisance and an abnormally dangerous activity" that gave a woman breast cancer and bowel disease, she says in a federal class action. 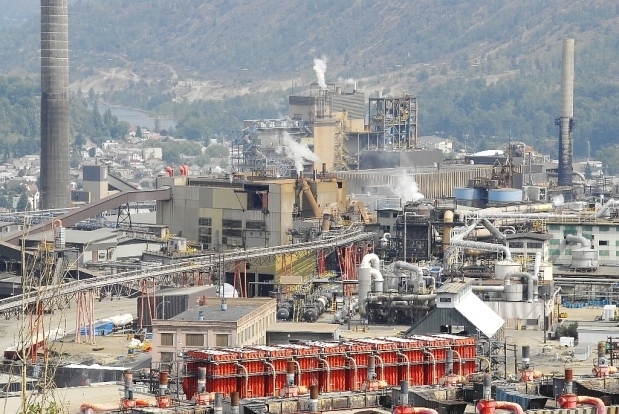 The Teck Metals smelter is in Trail, B.C., just over the border from where Barbara Anderson lives in Northport, Wash. Anderson sued Teck Resources and its subsidiary Teck Metals, for personal injuries and public nuisance. "The Trail Smelter is a metal and fertilizer production facility on the Columbia River, which Teck and its predecessors have owned and operated since 1896. Northport, Washington, also on the Columbia River, lies approximately 20 miles downstream from the smelter. The air pollution from Trail that travels south remains trapped in the Columbia River Valley, where Northport is located," the complaint states. Anderson says she was diagnosed with breast cancer in 2012 and diverticulitis, an inflammatory bowel disease, in 2010. "Plaintiff Anderson has lived in Northport since 1975. She was recently diagnosed with diverticulitis and with breast cancer. Five of thirteen toxins released from the smelter in substantial volume are toxins associated with her diseases, and it is more probable than not that her exposure to these toxins caused her injuries," she says in the lawsuit. Residents of Northport and the Upper Columbia River have "borne the brunt of the toxic discharges and emissions from the Trail Smelter," the complaint states. Residents have complained of inflammatory bowel disease, thyroid disorders, sinus irritation, eye irritation, chronic nosebleeds, respiratory problems and cancer, according to the complaint. The 30-page lawsuit details a long history of environmental problems at the smelter, including emissions of lead, arsenic and sulfur dioxide, discharges of slag and mercury into the Columbia River and groundwater contamination. The proposed class includes current and former residents of the Upper Columbia River, excluding Canadian citizens, who suffered injuries as a result of Teck's environmental contamination. "Teck negligently, carelessly and recklessly generated, handled, stored, treated, disposed of, and failed to control and contain the metals and other toxic substances at the Trail Smelter, resulting in the release of toxic substances and exposure of plaintiff and the proposed class," Anderson claims. "Teck also negligently failed to warn plaintiff and class members of the release of the metals and other toxic substances into the environment and community surrounding the Trail Smelter and of the reasonably foreseeable effects of such releases. Greg Belland, general manager of Teck Trail Operations said in a statement to the Rossland Telegraph newspaper: "We are supportive of the efforts of residents of Northport, Washington, a community south of Trail, to determine what is causing any unusual rates of illness in their community. It is important to note that we have not seen similar rates of illness in Trail. Further, a 2004 human health study relating to inflammatory bowel diseases (IBD) by the United States Department of Health found no link between the rate of IBD in Northport and in other counties in northeast Washington and Trail Operations. And, a recent study by the BC Centre for Disease Control found rates of IBD in Trail were far lower and not comparable to those reported in Northport." Anderson seeks class certification, declaratory judgment that operation of the smelter is a public nuisance, and class damages for negligence and personal injuries. She is represented by Steve Berman with Hagens Berman Sobol Shapiro in Seattle.